Welcome to Week 5 of the One Room Challenge. I can’t believe there is only 1 week left before the final reveal of our Wine Cellar! This wine cellar design will complete my fourth season of the “One Room Challenge”. So many other talented people are participating as guests, please check out their spaces too HERE. How comes it seems that weeks pass more quickly during these challenges than other times in the year? Go figure. Maybe I’m more stressed and worried about not meeting the deadline? Uhhh…yea definitely! We have made so much progress in 5 short weeks, you can check out before pictures and see the work that has been done so far in the links below. We have made great strides this past week, due to my very hard working hubby. He has spent countless hours assembling and nailing together the wine racks. We have about 35 racks in total that need assembly and he has done it all. We got our racks from Wine Cellar Innovations HERE, they supplied a nail gun free of charge which has made the process fairly easy. They have been great to work with and respond to my questions promptly. The racks are completely assembled and placed in the room according to the design. Each component is separate and must be secured to each other and to the wall. Finishing trim will also be added to the top of the 8 ft racks (crown molding) and base molding on the bottom. The countertop will also have trim with a rounded edge to give it a finished appearance. Adding accent lighting behind the baseboard HERE, brings a soft glow into the room. The rope lighting can easily plug into an outlet but we chose to have our electrician wire ours to a switch, which can be controlled with a remote. The room already had 4 wired sconces that we wanted to incorporate into our cellar design. The electrical boxes were a bit tricky to work with, due to the varying depths of each stone but we were able to change out the junction boxes and add ones that are more shallow, so the sconces attach closer to the stone. The sconces can also be controlled with a remote which has dimming capabilities. We added 32 inch long sconces in forged iron from Restoration Hardware. The shades are fabric and bring texture into the room. 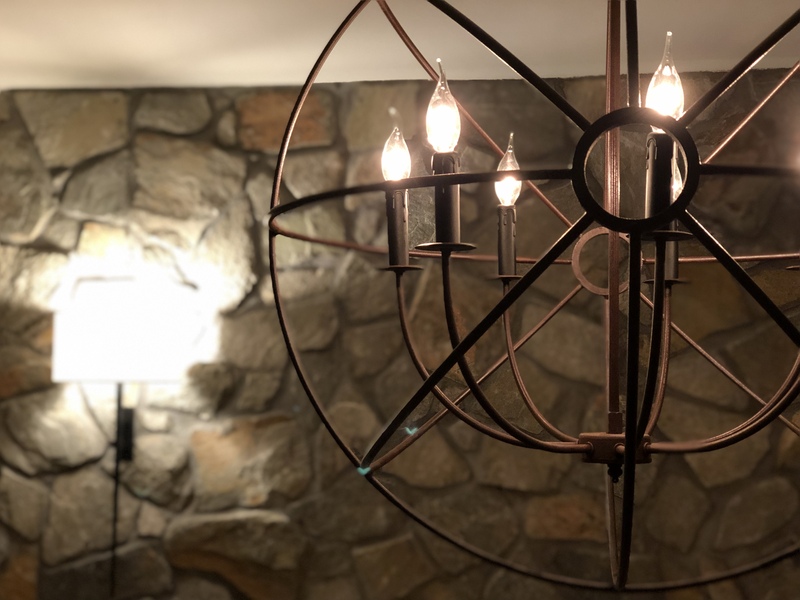 In the center of the cellar, we added an Iron Orb Chandelier also from Restoration Hardware, you can find a similar one HERE. We brought in a professional to help with securing racks to the stone. Since some of the racks are 8 feet high, they definitely need to be well secured to keep from toppling over especially when filled with wine bottles. We used metal brackets, and secured them into the mortar. The brackets are large and can adjust if needed. The brackets are well hidden behind the racks. Make sure to check back next week to see the final reveal! Don’t miss a post, subscribe to Happy Haute Home, and follow along on Pinterest HERE, and Twitter HERE and feel free to pin and tweet your favorite pics from Happy Haute Home. Holy cow- this is intense! “Sure I’ll just go get a bottle from the wine cellar.” Sounds like something I would LOVE to say in my house! This is amazing! LOL! It’s a fun thing to have in the house for sure 🙂 Thanks so much for stopping by!